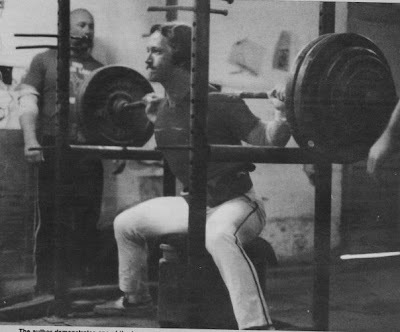 My primary reason for expounding on the routine that I’m about to give is that my training squat of 505 as a 181 pounder increased to a present (1982) best of 660 at 198 through its use . . . and this gain of 150 pounds was accomplished in only 30 months! Of course, I did manage to increase my bodyweight by 17 pounds during this time, but the gain was in the form of lean body mass as my percentage of body fat has remained at 10%. Simply stated, the box squatting routine to follow gave me very satisfactory results and there is no reason to think that it would not be very result-producing for anyone who tries it. When box-squatting, the lifter lowers himself to a box of sufficient height to approximate a squat position roughly two inches above parallel, sitting down on the box and coming to a near-dead stop. An arch is kept in the lower back throughout the movement and the lifter then rocks backward and immediately thrusts his hips and buttocks forward, driving to a standing position again. After this portion of the routine is completed, another box which allows the lifter to reach a position approximately one-half inch below parallel is substituted and the process repeated for a single set and repetition. There is no need to start light and warm up again as this would be self-defeating. A third box then can be used regularly or occasionally to supplement depth strength. A sub-box, as I call it, equals a squat of roughly two or three inches below parallel and is first-rate for building power to drive out of the ‘hole.’ Again, a single set is performed at this level. To an individual who is uninitiated in the technique of box squatting, finding the right height for the various positions can be confusing. Placing boards under the box allows for a perfect height adjustment. To get the most out of the box squat method, assuming the proper stance is important. All weights are taken with a wider-than-normal-stance to utilize the powerful muscles of the hip extensors. The lone exception to this is on the sub-box squat, where one’s regular squatting stance is used. Notice that I utilize single repetitions after a couple of warmup sets. This permits the usage of tremendous poundages. However, I do not constantly work with maximum poundages, preferring instead to utilize a 16-week cyclical program. The aforementioned poundages are what I reach in the final week. In the beginning of the cycle I start with 640 and 540 respectively as top singles in the box 2” above parallel and ½” below parallel, adding ten pounds weekly. The 2-3” below parallel segment is worked a bit differently as I begin with 400 for 5 reps and jump 20 pounds weekly for the first six weeks. From that point on to the conclusion of the cycle, I go in 10-pound jumps and drop to triples, doubles and finally singles. In addition to the box squatting program outlined here, there are also assistance exercises that need to be done to supplement leg, hips and lower back strength. After box squatting, an exercise called the reverse hyperextension should be done. It’s performed with the lifter in a prone position with his upper body on a leg extension machine – or any other surface at least three feet high – and his legs bent and dangling on the floor. He then raises his legs and hips up behind him as high as possible, contracting the lower back and hips. High repetitions (15-20) and additional resistance of 25 to 100 pounds – which can be attached to the ankles – give optimum results. In fact, this exercise alone – even without the use of the box squatting routine – will substantially increase one’s squatting strength!